Brooks Willhoite (from left), Ray and Theresa Vogelpohl and Darren Spinks. 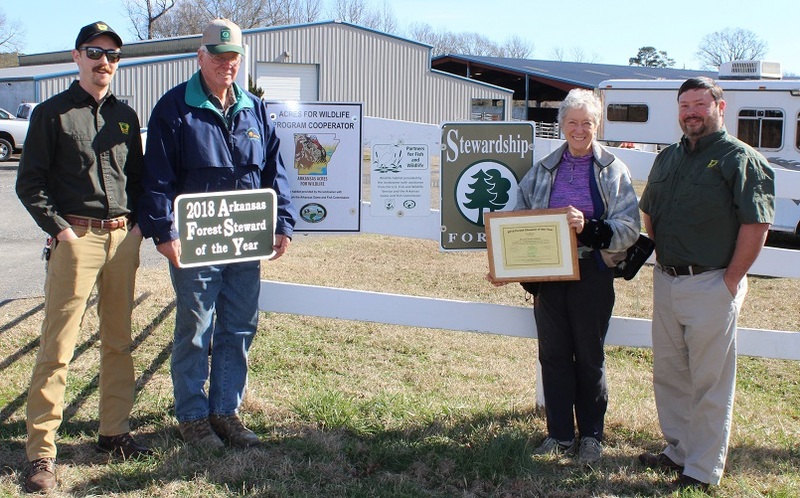 Ray and Theresa Vogelpohl of Perryville have been named the 2018 Arkansas Forest Stewards of the Year by the Arkansas Agriculture Department’s Forestry Commission. The Voglepohls were selected from nominations that were submitted by Arkansas Forestry Commission (AFC) foresters to a committee of representatives from partner agencies within Arkansas’s forest industry. The Vogelpohl family has a long history of good forest management, enrolling in the Forest Stewardship program in 1996 and becoming certified as Forest Stewards in 2016. Their primary management goals of their property, Diamond TR Ranch in Pulaski County, include conserving soil and water, producing healthy, valuable timber and quality wildlife. The Vogelpohls’ forest management efforts have included several seasons of prescribed burns for wildlife habitat enhancement, tree plantings along the Maumelle River, forest thinning and planting of native grasses. The Forest Stewardship Program recognizes and rewards landowners that are managing privately owned forestland for multi-uses, which could include enhancement of wildlife habitat, soil conservation, water quality protection, restoration and management of wetlands, and others. Arkansas is home to more than 1,200 certified forest stewardship landowners. The Forest Stewardship program is supported by the U.S. Forest Service and is a multiple-agency effort with partners that include AFC, Arkansas Game and Fish Commission and United States Department of Agriculture’s Natural Resources Conservation Service. Any private forest landowner with more than 10 acres is eligible to participate in the Stewardship program. Find more information, including program applications at agriculture.arkansas.gov/forest-stewardship.